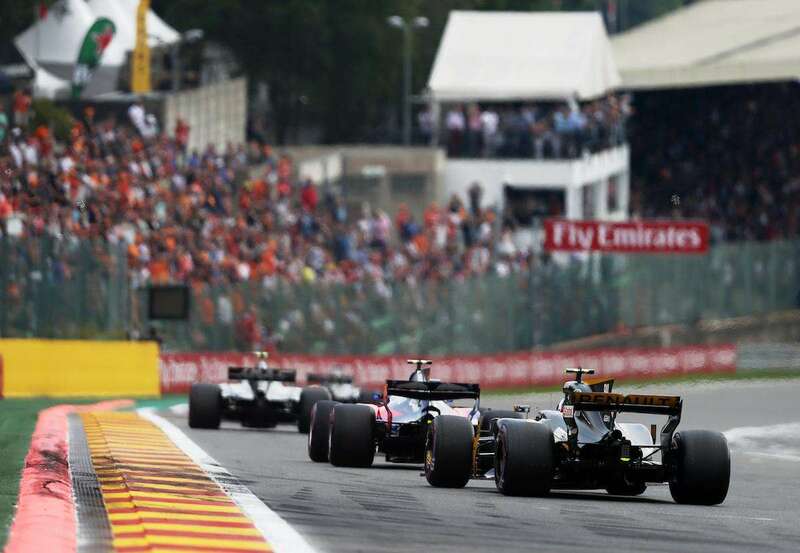 Your detailed guide to buying tickets and where to watch the action at Spa Francorchamps for the 2019 Belgian Grand Prix on August 30 to September 1. The Spa Francorchamps circuit in the picturesque Ardennes region of Belgium remains one of F1’s few remaining classic circuits. If you don’t mind braving the elements and doing a lot of walking, the Bronze (General Admission) tickets at the circuit are excellent value. 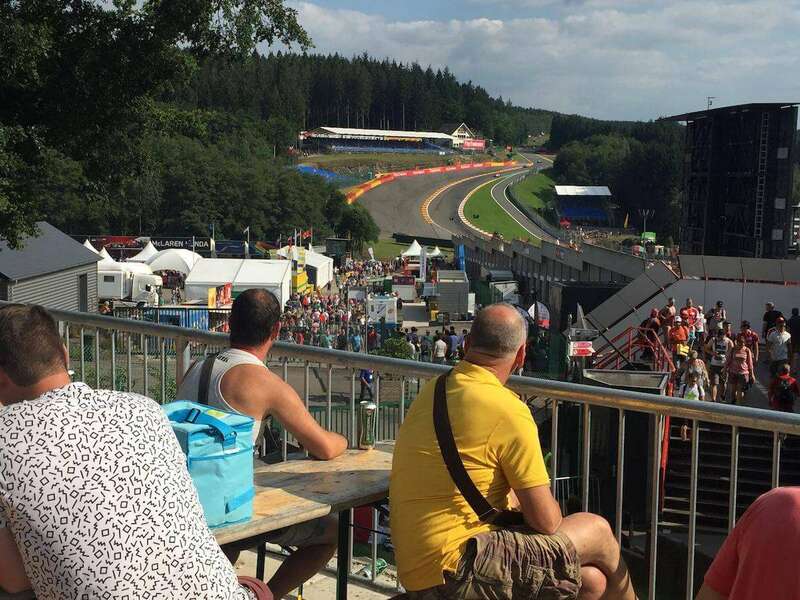 There’s also a good selection of grandstands to choose from at Spa, the majority of which are located close to the start-finish straight and Eau Rouge. 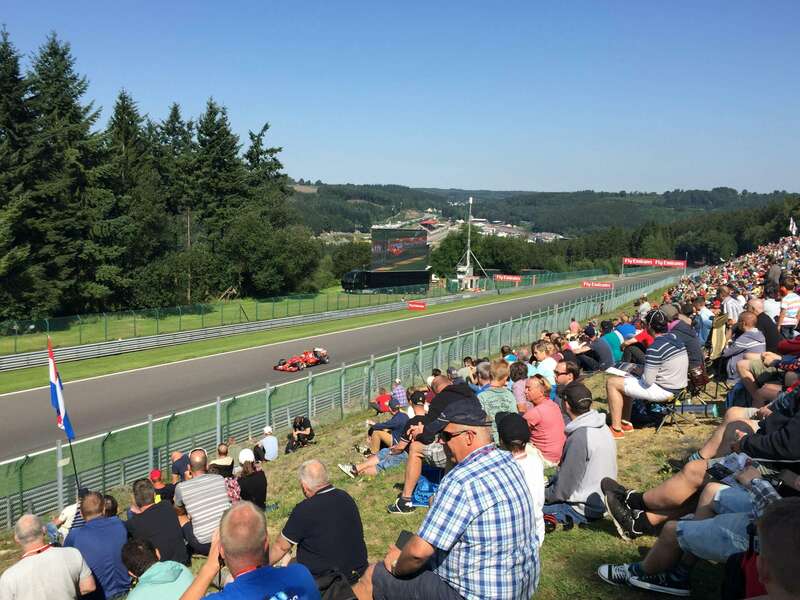 The Editor attended the 2018 Belgian Grand Prix at Spa Francorchamps. All images © f1destinations.com. Support the development of this site by buying your F1 tickets from our partners, Gootickets. We receive a small commission when you buy using the links on this page. We don’t apply any markup, so you’ll always pay the cheapest price! We also recommend Official Ticket Packages from F1 Experiences. All prices are for 3-day tickets. The cheapest General Admission tickets (Bronze) offer excellent value if you don’t mind roughing it on the side of a hill in the forest. If you can afford a grandstand ticket, then it pays to go for one of the covered ones due to the high chance of rainfall at Spa. The best grandstand is Gold 8 on the outside of the opening La Source hairpin, with views down the main straight; get in quick as it sells out early every year. Other good grandstand choices include Gold 3 and Silver 2 near Eau Rouge. Sunday-only tickets are available for all grandstands (tribunes) and General Admission, but the discount of approximately 10% over 3-day tickets doesn’t make them a particularly attractive option. Children’s Tickets (aged from 6-15) cost €25 for three days in Bronze (General Admission). Grandstand tickets for children are discounted by approximately 50-60% on regular 3-day ticket prices, but sell out quickly. Grandstand seats are numbered for all three days (there is no ‘Free Friday’ roaming option at Spa). A special podium for disabled fans is located next to the Gold 7 grandstand at La Source. All Gold and Silver grandstands have a big screen TV opposite. There are a handful of big screen TVs in the Bronze areas (General Admission), specifically on the Kemmel straight and at Pouchon. 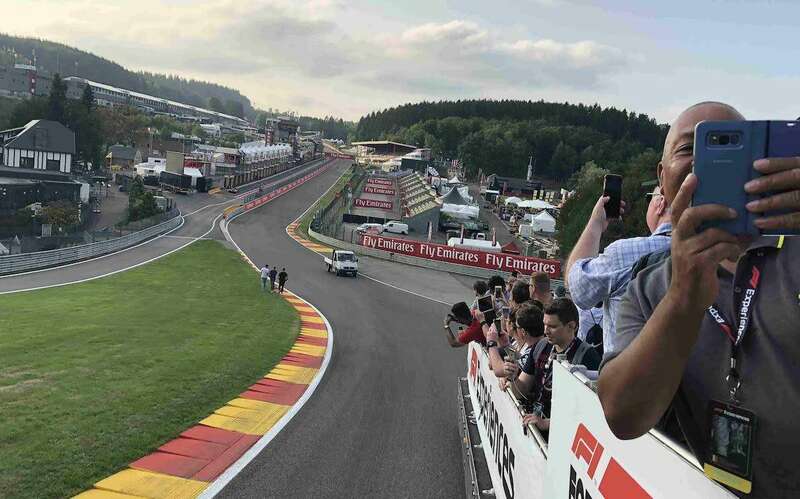 Official Ticket Packages from F1 Experiences at Spa-Francorchamps include select grandstands and exclusive hospitality in the Champions Club or Formula 1 Paddock Club™, plus unique benefits such as a Drive the Track Tour, Exclusive Pit Lane Walk and insider access to the F1 Paddock. The Champions Club at Spa-Francorchamps benefits from excellent panoramic views of Eau Rouge; recommended! Gold 1 is the main, permanent grandstand opposite the pits on the start-finish straight. A good choice for the start/finish and action in the pits. Choose another grandstand if you are after on-track action. 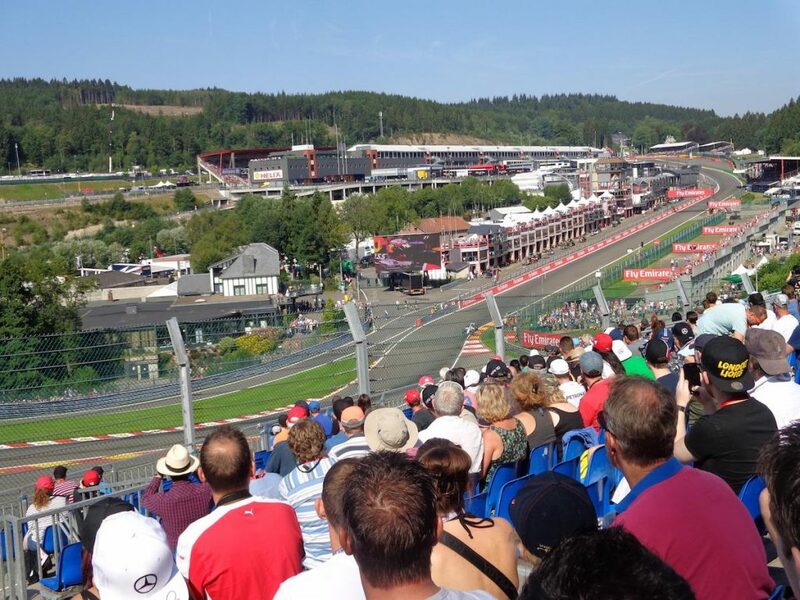 Gold 2 is a large, elevated permanent grandstand situated on the straight section between La Source and Eau Rouge, with direct views of the old pits area, which is still used by the support races (GP2, GP3 and Porsche Supercup) on Grand Prix weekend. 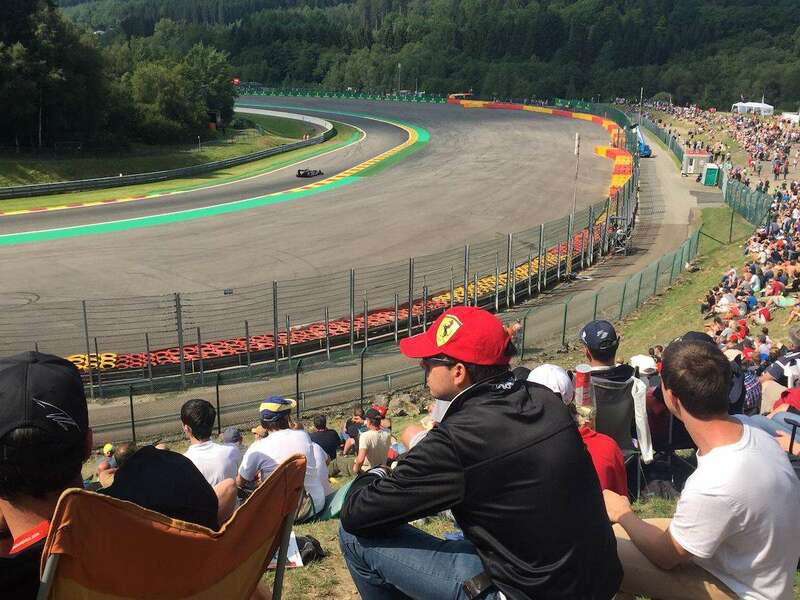 You do get distant views of Eau Rouge, but there are better Gold grandstands for this price. Gold 3 is the best grandstand overlooking Eau Rouge/Raidillion, offering excellent elevated views of the famous corner plus the section of track preceding it. 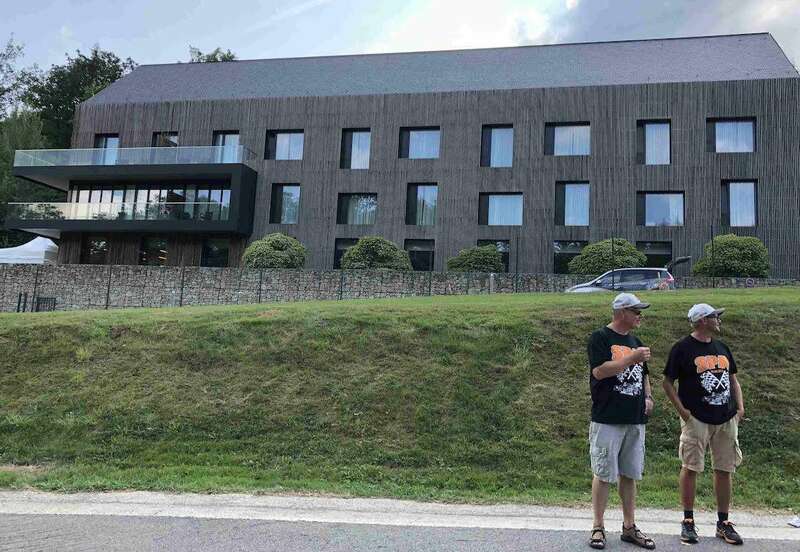 Note that you will need a certain level of physical fitness to get to this grandstand from La Source, as it is situated at the top of a steep hill. Recommended. Gold 4 is an uncovered Gold grandstand next to Eau Rouge. It is set back from the track at a strange angle with fairly limited views. Check out our panorama or watch our Youtube video. Pay a bit more for Gold 3 instead. Gold 6 is a small covered grandstand on the Bus Stop chicane, close to the pit entry. It’s one of the most expensive grandstands, but you can always expect some action at this point on the circuit over the course of the weekend. Avoid seats in the front rows if possible, as views can be restricted. Gold 7 is located on the exit of the La Source (turn 1) hairpin and doesn’t have views to compare with Gold 8. Better to choose one of the Eau Rouge grandstands if Gold 8 is already sold out. 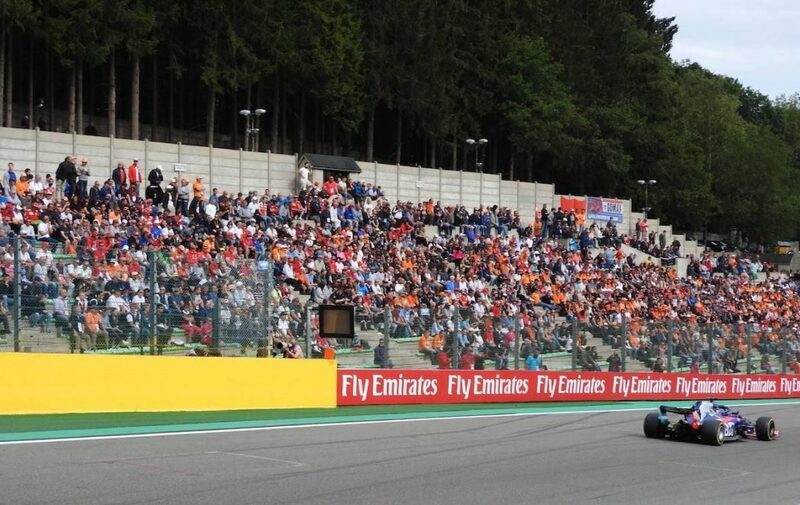 Gold 8 is situated on the La Source (turn 1) hairpin with views down the start-finish straight. The popularity of this grandstand is evidenced by the fact that it sells out almost one year in advance! If you get the choice in this grandstand, go for block B over block A. Gold 9 is a smaller, temporary grandstand closer to the opening La Source hairpin on the main start-finish straight. Located in front of the ‘slower’ teams’ pits and with a distant view of La Source for the inevitable action on the first lap. Silver 1 is located on the stretch between La Source and Eau Rouge. You still get an individually numbered seat in the bleacher-style Silver 1 & 2 grandstands, but they don’t come with a back for you to lean on. In both grandstands, go for seats in the high rows, otherwise your views will be obscured by the catch fencing. Silver 2 is located closer to Eau Rouge, making it a better choice than the identically priced Silver 1. 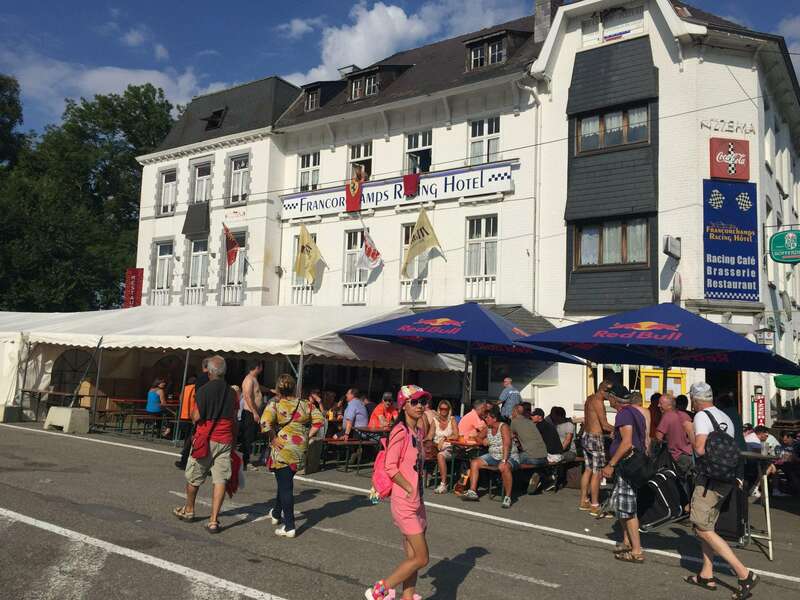 An excellent mid-range choice at Spa with good access to the best food and drink stalls, merchandise and atmosphere of the F1 fanzone, right behind the grandstand. Silver 4 is located at the top of the circuit, a long way from all the others (plus a long way from the fan zone). It overlooks the slow Bruxelles corner, but there’s much better views from the General Admission area on the inside of the corner. Silver 4 has individual seats with backs (like in Gold). Go for the higher row seats so your views aren’t obscured by the catch fencing. Area 17-27 overlooks turns 15-16 at the southeasternmost point of the circuit and is restricted to fans aged 17-27. 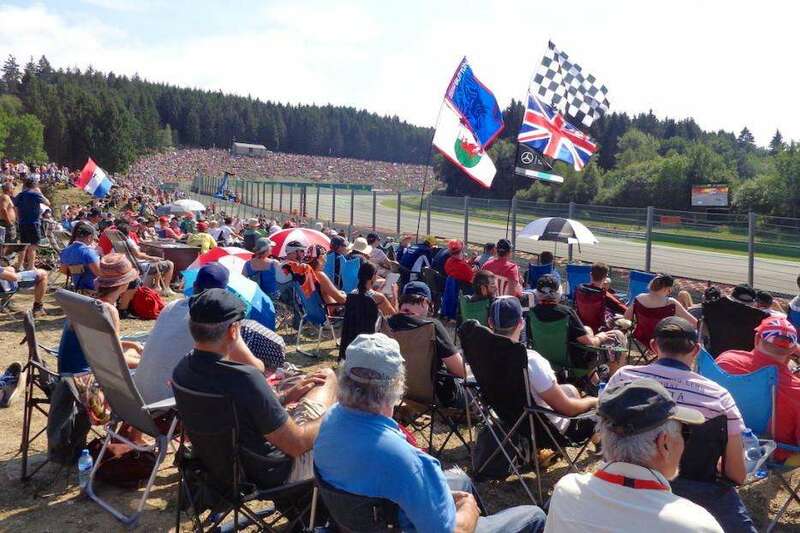 It’s a long way from the rest of the main spectator areas at Spa, but is very much self-contained and also connected with a special camping zone for young fans. 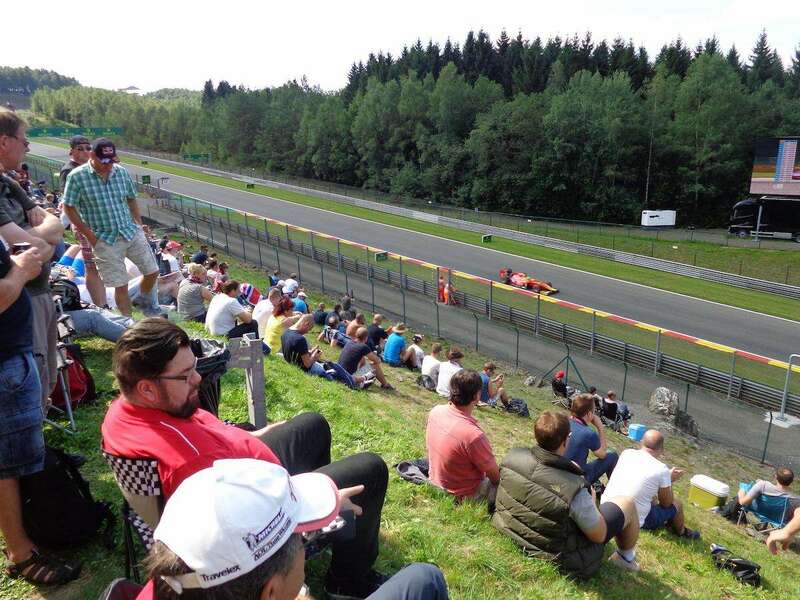 Spa Francorchamps has some of the best General Admission areas of any current F1 circuit, but you’ll need a certain level of physical fitness to make the most of its stunning forest location. Many of the walkways are unpaved and there’s serious hills involved, especially around Eau Rouge. Make sure you wear comfortable shoes and if rain is forecast, a pair of wellies will definitely come in handy. Once you have negotiated the steep path up the hill from Eau Rouge, you arrive at the area known as Raidillon. If you are lucky, there’s views of the cars emerging from Eau Rouge at high speed. The general admission area is quite limited here, and you’ll need to wait you turn (or get there very early on Sunday) to catch a glimpse of the cars through the handy ‘photographer’s gaps’ in the catch fencing. Once you get to the Kemmel straight, there’s much more room to find a vantage point on the side of the hill. 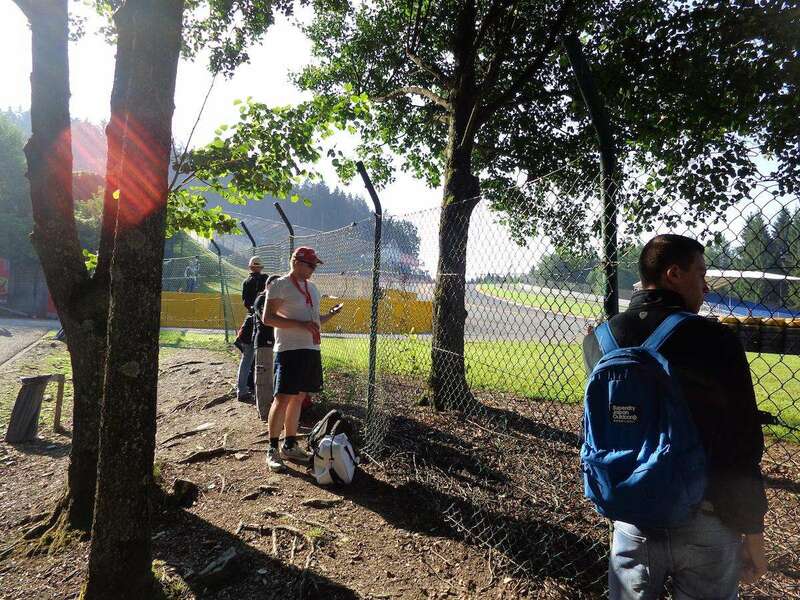 There’s more fans closer to the Les Combes chicane, where many famous overtakes have happened over the years. Check out our photos and Youtube videos below. This area at the top of the circuit is a great spot to watch the action. You can get really close to the cars as they take turn 10 at low-speed and it’s an excellent spot for amateur photographers. It’s a small area however and you’ll need to compete for a spot with the regulars who come every year; get there at the crack of dawn if you want to see the race from this area. The panoramic views from the top of the hill at turn 11 down to Pouchon are also not to be missed. Check out our video of the Bruxelles view. This is arguably the most popular general admission area at the circuit. There’s plenty of room on the hillside for several thousand fans to watch the cars approach the tricky Pouchon corner. The food and drink stalls at Pouchon are extensive, and the atmosphere is great. You can walk back to Eau Rouge via a flat, direct forest path in around 15-20 minutes. Please note that a new grandstand (Silver 3) was added on Pouhon corner in 2016. The Bus Stop chicane is another decent general admission vantage point, but there’s limited space to get great views, unless you fancy climbing a steep embankment. The views are also partially blocked by the Gold 6 covered grandstand. There are no grandstands on the high speed Blanchimont section of the circuit, and the views in general admission are limited to those from the path, which eventually leads below the circuit and emerges near the Les Fagnes area of the circuit, close to Pouchon. The 17-27 area for young fans is located here, but there’s limited track views for everyone else. Been to Spa Francorchamps? Leave a comment with your favorite grandstand. We are planning a trip to spa and monza. Our children are coming with us and they’re going to be 2 1/2 and 1 by that time. Are they allowed to go? Do we need to get tickets for them? I know they’re not necessarily going to watch but our hotel isn’t that far and my husband will most likely watch the races. Thanks for your input! Hi Andrew, i want to ask, how about the track walk or f1 drivers fan meeting? What day they will have it? Hi Elli! We mention the pitlane walk in our Trackside section. This normally takes place on Thursday from 16:00-18:00. You can enter via La Source. Don’t forget you also need a 3-day ticket to take part. We did it last year, which you can read about here. 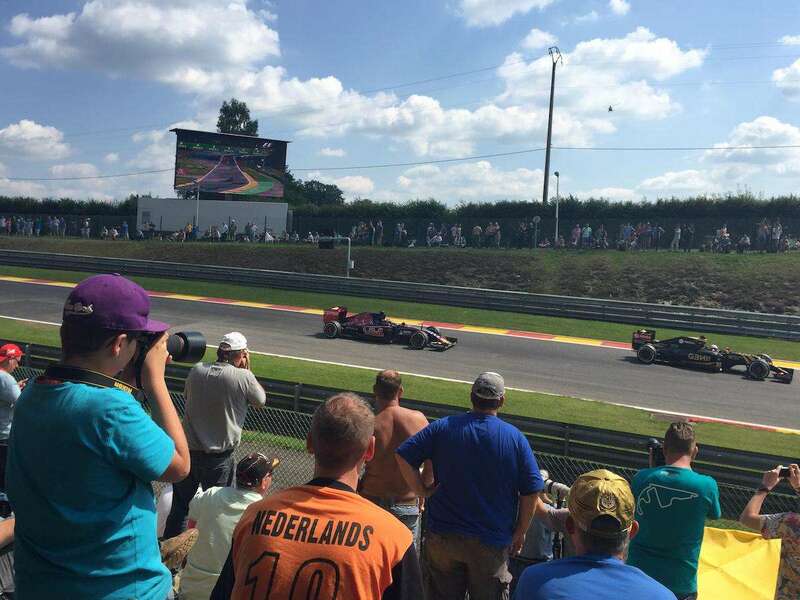 I will be attending the 2017 Belgian GP and plan to buy tickets in one of the Gold grandstands. I’ve gone through the ticket buying process up to the point of making payment and I don’t see anywhere to choose which seats you would like to buy. Are seats in the grandstands reserved, or is it first come first served? Hi Brian, seats are reserved in the grandstands, but you cannot normally choose your exact seat in the grandstand (depends on the race and where you buy your tickets from). With our supplier Gootickets, you can make a request when booking for a particular seat/section, which they will try and accommodate based on their ticket allocation. There is no Free Friday, so you can’t sit in the grandstands. But you can still go through all the Bronze (General Admission) areas. Some areas are restricted to Gold ticket holders only (including the area near the start-finish), but you can get some limited views of La Source on the way down to Eau Rouge. There is also an underpass from Eau Rouge to the inside of the track from where you can walk around to the final Bus Stop chicane (via the support race paddock) and down to Blanchimont. Hello John, the disabled podium is situated next to the Gold 7 grandstand on the outside of the first corner, La Source. The disabled parking area is located just behind the grandstand. I suggest you are patient when leaving the circuit at the end of the race. Stay around and soak up the atmosphere! Otherwise, you will be stuck in traffic for probably 2-3 hours leaving the circuit. The roads are narrow and there’s lots of cars! Hello Andrew, first time at spa this year and I have 2 adult gold 7 tickets. Now I’m regretting not getting my 6 year old son a ticket. Could I buy him a general admission ticket for the Friday only and use my gold tickets for us both to experience the Friday itenary in the general admission areas? Which spot would you recommend, taking a young child into consideration? I am thinking of booking parking near gold 7. I have found this guide very useful but I would like some extra help if possible. I am getting the bus from verviers (Number 294?) to the circuit and would ideally like to be around the pouhon corner, is it clear which entrance to use? Or is it all in one? Basically as my girlfriend is pregnant we need to be close to toilets / food places! An help and advice for a first time attendee would be greatly appreciated! Hi Louis, the 294 bus will drop you close to the La Source entry to the circuit (I’m pretty sure on this, but not 100%). 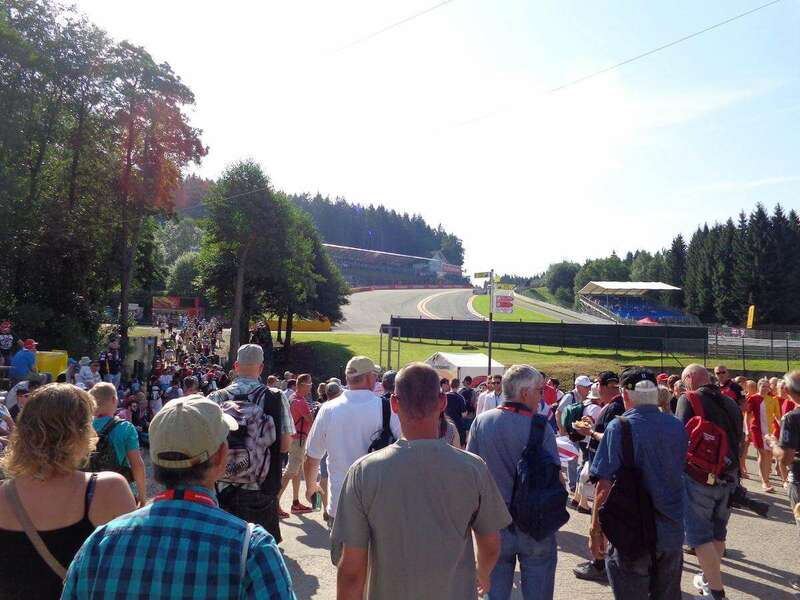 From there, you have around a 15-20 minute walk to Eau Rouge, then you can go under the circuit and walk through the forest to Pouchon, another 15-20 mins. There’s plenty of food/toilet places at Eau Rouge and also at Pouchon. Good luck! Sorry also one more thing, with the free coach to the circuit does this fill up fast or will there be space for everyone? This is the one on Sunday? I’m sorry, I really can’t answer. But I suggest getting there early. Hi Charlie, anyone can attend, including Bronze ticketholders. If you want a good view of the podium, I suggest you get to the area at the end of the straight (La Source or Bus Stop chicane) as early as possible; i.e. around 10-20 laps before the end of the race. Hi, advance planning for 2018! not been to Spa before, looking at Gold 9 stand but have seen so many different suggestions for parking! What would be our best bet? Thanks. Hi Jason, the Yellow zone parking is best for all the Gold grandstands near the pit straight and Eau Rouge. I estimate it’s around 20-30 minute walk from parking to grandstand. Hi Alison, you can go anywhere you want in the Bronze (or General Admission) areas. But be aware that the best spots on race day will be reserved very early. There are toilets around the track. Some are free and some cost around €0.70. Will a 3 day grandstand ticket, either silver or gold, allow access to all general admission/bronze areas across the 3 days. Yes, you can go in the General Admission/Bronze areas with a grandstand ticket. My question is can you go to grandstands in the support races with bronze ticket? F2, Porsche…. No you cannot get in the grandstands at all with a Bronze (General Admission) ticket. Wanting to cycle to the track – I read that you cannot take bikes into the circuit – is there anywhere to lock bikes securly? Hi, anyone who has experience with the Speed Corner Grandstand at Turn 9? I was this year on Gold 3 and I am thinking of going 2019 again. But as I wanna go to China, Germany and Japan, too – I am a little bit on a budget. General Admission is about 130€, Speed Corner about 200€. Does the 70€ worth it to have a Grandstand seat over the weekend? I’d say it’s worth the extra money, although I haven’t actually sat in that particular grandstand. You still get to use the General admission areas, so it’s a win win situation for race day when you don’t have to fight for a place to watch the race. Thanks Andrew, just the same thought as I had in my mind. I saw the Grandstand on Friday this year from the opposit side when I was walking around during FP1. Hi I have purchased Silver 3 experience tickets with F1Experiences.com. Where is the best place to park and where can I get the parking tickets? Also, do we get seat assignments at Silver 3 do you know as I cannot find the information on the site used. Finally (sorry for the spam) I am hoping to take my DSLR and lenses, do you have a recommendation of focal length? Saves me taking the whole kit! Ha. Hi Kirstie, for Silver 3 it’s recommended that you park in the Green parking zone (you can buy tickets here for 16 EUR per day). You will receive a specific seat number on your ticket; but you won’t know this until you actually receive your tickets a few weeks before the race. For camera, max recommended is 400mm to enter the circuit- you may not be allowed with larger. Looking to book Gold 3. Am I right in thinking seats to the front of the grandstand are best as further back the cars disappear for a bit? Which block would you try and get seats in? D? Hi Hannah, sorry but I’ve never actually sat in Gold 3, so I cannot say for sure what is best. Watch a video here. From the video, it does look like the front seats would be better. To be honest … I was at Gold 3 last year, Block B in Row 18 … and in the end, Gold 3 is not the best option and does not justify the high price (my opinion). The grandstand is very flat … seats in higher rows => bad view! Also the cars disapear almost when they have passed Eau Rouge … the uphill part is in most of the seats not visible! Of course it is great to see the cars from La Source up to Eau Rouge, but thats it! After the race I checked out Gold 10 and Gold 4 … to be honest, if you want to seat at Eau Rouge / Radillion take Gold 4! It is cheaper (no roof) but offers also a good view on the rundown from La Source and you can see the cars in Eau Rouge!